Good morning, chic readers! We hope your Thursday is off to a great start! We’re pondering our favorite cabinet styles today. Few decisions in a kitchen are as major, as expensive or have as big of an impact, so it’s one of those ones that is important to get right! If you’re looking for something simply elegant without too much fuss for your kitchen cabinet remodel, flat paneled cabinets are a perfect choice. One of our favorite kitchen styles is a combination of glass-front cabinets and closed cabinets. Glass front cabinets are perfect for display, but it’s nice to have a few to hide messier items behind as well! Sometimes our favorite cabinets are… no cabinets at all! We love open shelving as a chic and inexpensive alternative to upper cabinets. So cute! 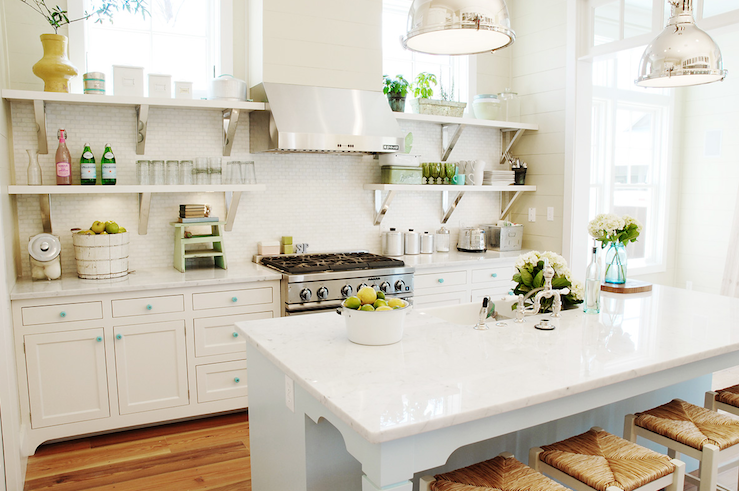 You know we love white kitchens, so, to us, you can never go wrong with white cabinets. But dark wood is also a stunning look that creates depth, warmth and contrast in a kitchen. Love the wood feel but want just a touch? Light wood is such a pretty choice, and these light wood open shelves give just a hint of wood without being too dark. Dark painted cabinets can make a kitchen feel dark and heavy, but, when paired with light floors, backsplash and tons of light, they’re such a perfect choice! So, sure, we love white and wood, but there’s nothing like colored cabinets to add instant personality and fun in a kitchen. Especially in a vacation home, when you pick the right shade you really can’t go wrong! Can’t make up your mind? We totally understand! Why not mix and match? It’s the best of both worlds and gives any kitchen a totally custom feel. If you were redoing your kitchen. what cabinet style would you choose?